The Strict scenario is a group-based implementation. Users are assigned to roles with varying access to the groups. This scenario focuses on two groups, Development and Production. Development is the group of MySQL instances where the product is developed and tested. 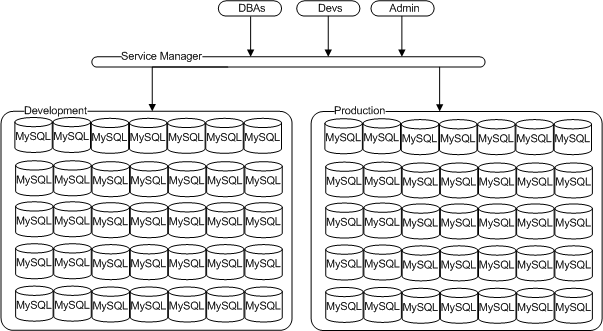 Production is the group of MySQL instances to which the finished product is deployed for customers to use. Development: all assets used by the development and quality teams are grouped in the Development group. Production: all assets deployed for use by the customer are grouped in the Production group. When installing agents to monitor the assets, it is critically important to chose the correct group during the installation process. If the incorrect group, or no group, is chosen, the assets fall outside the scope of the Roles defined here and cannot be seen by any user except those in the SeniorDBA roles. GroupAdmin: System-wide role. Members are responsible for user, role, and group management only. This role is limited in the sense that it does not have the Server Group or MEM Web Application permission set to a usable value. To access the UI or create groups, the users assigned to this role must also be assigned to roles with usable Server Group permissions (Read-Only or Administer). SeniorDBA: System-wide role. Members have access to all monitored assets on both Production and Development groups. No group-specific permission sets. JuniorDBA: members have read-only access to the monitored assets in the Development group, only. SeniorDev-Development: members have limited access to monitored assets in Development group. Members of this role need permissions to view events, Query Analyzer data, and create event handlers on the Development assets. Members of this role are responsible for inspecting the impact their code has on performance and existing functionality. SeniorDev-Production: Same members as SeniorDev-Development, but restricted rights on the monitored assets. Permissions to observe, only, no rights to create event handlers, set blackouts, or access the Query Analyzer's Explain or Example functionality. This role does not include any observation of customer data, but does allow its members to view events generated on the monitored assets. If a member of this role requires an event handler or advisor threshold edit on the Production group, it must be requested from a member of the SeniorDBA role. JuniorDev-Development: members have access to the Development group, only. For the most part, their permissions are read-only. They are entitled to view events, Query Analyzer data, and so on. DBA Teamlead: manages the DBA team and has complete access to all monitored assets. This user is a member of the SeniorDBA and GroupAdmin roles. This combination of permissions gives them complete access to all monitored assets. Senior DBAs: responsible for the monitored assets. Has complete access to all monitored assets. No user management rights. Junior DBAs: responsible for investigating issues. Read-only rights on all Development assets. No access to Production assets. Senior Developers: responsible for deploying code to the Development group and reviewing impact on performance and functionality. No user management rights, event blackout rights, and so on. Permitted to view events on the Production group, but not to add event handlers, notification groups, and so on. Junior Developers: responsible for deploying code and viewing events on the Development group. No access to the Production group. For each of these roles, select System-Wide Permissions in the Core Monitored Assets frame. SeniorDBA Role: DBA manager and Senior DBAs. GroupAdmin: DBA manager and at least one Senior DBA, for redundancy. For each of these roles, select Group-Specific Permissions in the Core Monitored Assets frame, and select Development from the group drop-down list. Currently, Advisor Configuration and Event Handling are global permissions. 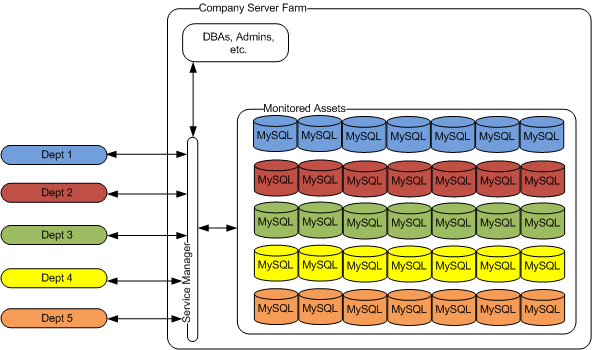 Changes made at that level can affect all users of the MySQL Enterprise Monitor. As such, only a senior user, with System-Wide permissions, should be permitted to change these settings. For this role, select Group-Specific Permissions in the Core Monitored Assets frame, and select Production from the group drop-down list. The Strict implementation is also useful for large companies with globally distributed teams, accessing central server farms. Company server farm with DBAs and individuals responsible for liaising with departments. Departments with their own DBAs, Developers, and so on. This implementation includes the following departments, each with an identical permissions set: BlueTeam, RedTeam, GreenTeam, YellowTeam, and OrangeTeam. Groups must be configured for each department. In this scenario, BlueGroup, RedGroup, GreenGroup, YellowGroup, and OrangeGroup. Where each group contains the assets dedicated to each department.